The resurgence in bed bugs over the last decade shows no signs of abating. In fact, more than 6.7 million online searches over the past year focused on these nocturnal pests. Our NJ bed bug specialists offer this important information about these annoying insects from the New Jersey Department of Health. Bed bugs are roughly the size of an apple seed, small enough to fit into narrow crevices but large enough to be seen with the naked eye. They’re oval-shaped with a flat, wingless, rust-colored body and antennae. While bed bugs are a nuisance, they don’t transmit diseases. 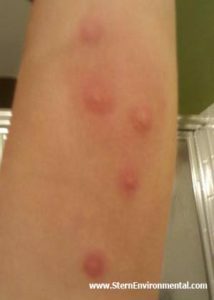 Bed bug bites are generally painless but they can develop into an itchy rash, especially if the affected person has allergic sensitivities to the insect’s saliva. 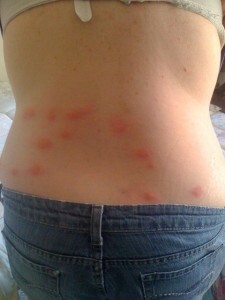 Red bites and welts are often the first signs of bed bugs. In addition, you may find tiny dark spots from crushed bed bugs or bed bug droppings on sheets and mattresses. How Do Bed Bugs Enter a Home? Contrary to popular belief, a bed bug infestation doesn’t mean a dirty home. Bed bugs are opportunistic pests that attach themselves to clothing, furniture and other items brought into buildings. Bed bug removal is not a DIY job. Contact Stern Environmental Group for quick and effective pest control services at your home or business. Sleeping should be a relaxing, worry-free necessity, and if it’s not, why is that? There could be a long list of reasons why you are having trouble sleeping peacefully. If you are a New Jersey local the main reason could be because of unwelcome guests. According to the NJ Department of Human Services, bed bugs are infiltrating a number of households, dormitories, hotels, and other popular establishments. – Hire someone who is a currently licensed NJ pest control exterminator. – Find out if the company you’re considering uses chemicals that are considered dangerous to your health. – Bag any infested articles of clothing or bedding and either dispose of them or wash them in water 120 degrees or hotter. Contact Stern Environmental for an appointment today! Our NJ pest control experts are knowledgeable and willing to help you rediscover your sound sleep! We eradicate bed bugs with methods that keep you and your loved ones safe! Close encounters of the biting kind are something you might expect to see in a vampire movie, but in reality, the biting can be the result of bedbugs. A patron learned this, the itchy and scratchy way, when staying at a hotel. A NJ pest control technician was sorely needed at a California hotel when a model for Victoria’s Secret found she wasn’t alone in her room. She had unwanted guests for dinner and she was the main course. Sabrina Jales St. Pierre booked a room at the Palm Desert Embassy Suites while visiting the city in 2016. Little did she know it would become a nightmare. Ms. St. Pierre experienced severe bites over a good portion of her upper and lower body. The hotel manager denied having any issues with bed bugs and none were found when the hotel room was checked. As a result of the incident, Ms. St. Pierre filed suit against the hotel property, Hilton Worldwide, Inc., for punitive and monetary damages. 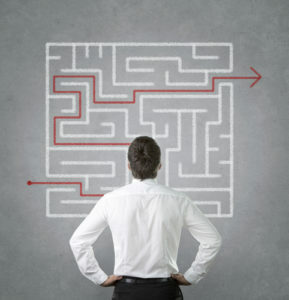 This could result in a costly bill for the hotel brand in both a monetary payout and in the hotel chain’s reputation. If traveling, find out what you can do for protection against bed bugs. 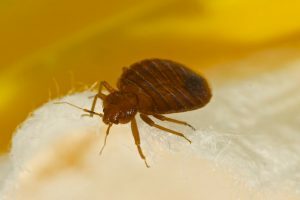 If you have bed bugs in your home, a NJ pest control specialist has the knowledge and treatment plan to eliminate the problem. For information about both issues, contact Stern. 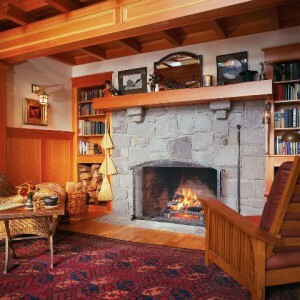 Many people enjoy a relaxing evening lounging in their favorite chair or stretched out on the sofa. When it’s time for bed, snuggling up under the covers for a good night’s sleep is the plan. While all of these relaxing activities sound enticing, if bed bugs are lurking in your furniture you could be facing an itchy nightmare. If you’ve never encountered bed bugs, be glad. They feed on the blood of humans and animals. Although they’re not disease carriers, they can cause problems for those prone to allergic reactions to bites. They are savvy pests that stay hidden throughout the day and emerge at night heading to areas where food sources are available: bed, sofa, chairs. Since bed bugs are so clever at hiding, there are certain signs you or an NJ pest control specialist will look for. These include checking around bedding, mattresses, the entire bed frame, drawers in desks, chair, and sofa cushions, and behind framed pictures. Other areas that may be potential hiding places include behind wallpaper, cracks in laminate or wood flooring, carpet seams or edges, and any cracks or crevices around windows or doors. To keep your home bed bug free requires more than over-the-counter products. With the help of one of our NJ pest control professionals at Stern Environmental, we will inspect, treat, and eliminate an infestation. Call us today.